Parma have returned to Italy's professional ranks after the reborn club clinched promotion in their first season following bankruptcy. The new club secured promotion to the third tier with a 2-1 victory over Delta Calcio Rovigo on Sunday. The two-time Uefa Cup winners were wound up last summer after racking up debt of more than 200m euros (£143m). 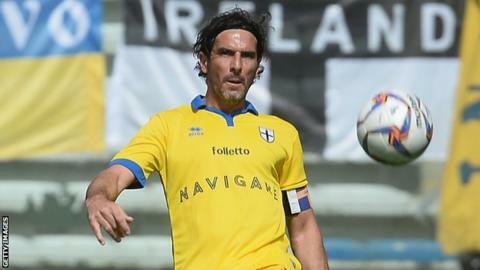 "The message that comes from Parma is that we're back," said captain Alessandro Lucarelli. Parma have eased through Serie D, the highest level of amateur football in Italy, setting a league record of 85 points from 35 matches. The new club, formed in July, is backed by pasta maker Guido Barilla with former coach Nevio Scala as president. Scala, 67, guided Parma to three of their four European successes in the 1990s. In addition to two Uefa Cups, between 1992 and 2002 Parma also won the European Super Cup, European Cup Winners' Cup, three Coppa Italias and an Italian Super Cup. "We are enjoying the rewards of an extraordinary ride," said Scala. "Let's enjoy the victory, as it's the first of a process that we hope will see us as contenders again next year." Coach Luigi Apolloni, the former Italy defender who played for Parma between 1987 and 2000, added: "This was a victory for the whole city." Where did it all go wrong for Parma?